You’d think I’d have better words for this. Goodness knows I’ve thought a lot about it. The ‘it’ is Saturn in Sagittarius. For the last three years, Saturn has traversed this mutable fire sign, which feels happier with Jupiter’s exuberance than Saturn’s austerity. Sagittarius hasn’t been happy about Saturn and Saturn hasn’t been happy about Sagittarius. It has not been a love affair for either archetype. Am I being silly for thinking archetypes can be in love? This is simply a frame, a way to understand why the last three years have given us more problems than answers. This surprises me, not that a Saturn transit can be difficult (they usually are), but that the conclusion of this one doesn’t feel like a victory, or like a hard-won realization that our challenges have made us wiser, given us concrete answers, created something we can build upon. Frankly, it is a little embarrassing to say I don’t know what Saturn in Sagittarius has given us. Perhaps you will draw a more beneficial conclusion. Sagittarius is a sign that searches for meaning and constructs stories from the journey. Stories have power. They tell us what is true, what is believed, what is acceptable. Words and stories can craft reality through manipulating beliefs. We’ve seen this over the last three years. Have we learned also to see through false stories? That would be what I’d expect at the conclusion of a Saturn transit: more tools, more skills, more discernment. Can we say that is so? Truth is slippery. It is fascinating that Mercury is retrograding around Saturn in Sagittarius as Saturn concludes this journey. Mercury is slippery, just like words. What have we really learned? Can we put our hands on it? How afraid are we that we are no better off than before? Perhaps this is the best I can say, Saturn is a realist. Over the last three years, we may not have come to a better understanding of truth, but we do have a better understanding of how stories and lies can distort our realities. We know it is important to pay attention to the messages. We know it is important to know what gives our lives meaning, but maybe we have also learned the importance of reaching across differences, making bridges and alliances that corrupt oppression. For me, this is the growing edge of Saturn’s transit through Sagittarius—the necessity of traveling outside my bubble to co-create new stories of connection with people very different from myself. Have you learned this necessity too? We’re on the threshold of a new Saturn journey. Saturn leaves Sagittarius and enters Capricorn on December 19 and stays there until December 2020. Saturn IS happy in this sign. In fact, Saturn rules Capricorn. We are about to get big doses of reality. When Saturn enters a sign new parts of us are called to pay attention. If you have any planets or important points in any Cardinal sign (Capricorn, Cancer, Aries, Libra), this part is poised to receive challenges and gifts from Saturn. This lunar cycle is a time to pay attention to what your next work will be. It is an important time to consider our intentions for the year. The seeds planted now will influence us for the next three years as Saturn transits Capricorn. Cardinal sign influence is about initiating solutions to the problems exposed through the previous mutable sign experience. Mutable signs integrate and prepare the way for the next round of action and decision. Saturn in Sagittarius (mutable fire) took away the notion of dependable and absolute truth. For a while, it seemed that truth wasn’t a thing at all. Manipulators, like Putin and Trump, moved into the vacuum in an attempt to shape the story to their agendas. As the final wave of Saturn in Sagittarius crests on the shore and recedes, left behind is the necessity of remembering our values and our immutable truths. What do you know beyond all doubt? Perhaps it is Love. Perhaps it is Connection. Perhaps it is Justice. Use this lunation to make your truth big to access strength for the next stage of our lives on this planet. December 18—New Moon: Seeding. Seeds are quiet. They rest in the dark. In their own time, they begin to tremble and burst with new life. In the dark time of the year for those of us in the northern half of the world, we connect with the patience and potential of waiting seeds. Sometimes it can be difficult to allow our own seeds this resting time. We may want to grab for the journey ahead. We may want to take on a hero’s mentality around conquering our fears or meeting our challenges head on. We may keep piling on things we want to change about ourselves (oh evil New Year’s resolutions). We may stress ourselves out about missed opportunities to get a good start on new intentions. I am as guilty of this as the next person. So perhaps what I say next is really meant for me: Let it go. Let the darkness be. Let the seeds wait. Let the next thing approach us rather than impel ourselves towards it. Let it happen. I’ve been thinking about colonizing mindset lately and the way it intersects with consent. Colonizing mindset says life is out there to conquer, own, master. Consent says, we deepen relationship and responsibility by listening for the desires of others before we try to take. A dear friend recently taught me this reframe, rather than saying/thinking these simple words: Take a breath, what if we said instead, Receive a breath? What if we took less, or none at all of anything? What if we asked first? What if we realized that everything is a potential gift if we listen for consent and agree to be in active exchange with the gift giver? There are gifts we “take” for granted, like breath. What if we know it is a gift? What if we lived in thankfulness for the giver and the gift? Waiting in the dark to be given our seeds for the next growing cycle is good anti-colonizing work. As we wait for this Sagittarius/Capricorn lunar cycle to begin, let’s practice listening and opening. Here are some things to think about as we wait. This lunar cycle begins on the threshold between signs. (This has been the case since August 2017 and will continue for the next year as New Moons start near the end of a sign followed by a Full Moon illuminated by the next sign across the threshold.). We start this lunar cycle near the end of Sagittarius with Saturn in Sagittarius right on the edge of Capricorn. The Sun will conjoin Saturn at zero degrees Capricorn on December 21. Most of this lunar cycle, though seeded in Sagittarius, will have a distinct Capricorn focus. Our seeds are influenced by the transition from Sagittarius: synthesizing truths, journeys of discovery, touching and linking diverse points of view, claiming our freedoms. Our seeds spend time with Capricorn themes: accountability, foundations, aspirations, hard work, integrity, reality. Mercury is moving retrograde in Sagittarius. Truth is up for grabs. We may not know yet. We wait for clarity as Mercury stations direct on December 22 and meets Saturn for the last of three times on January 13 at 2 degrees Capricorn. This meeting may signal the reception of knowing what our next work is. Venus will meet Saturn at zero degrees Capricorn on December 25. Venus and Saturn are conspiring. They are friendly and inviting us to exceed our expectations by receiving the gifts of the quiet and the dark. Our seeds are blessed. We are humbled. Although January 1 is a somewhat arbitrary beginning point of the year, this day still resonates strongly as a new beginning. The Full Moon in Cancer taking place on the first day of the year brings light to our hearts. The waning half of this lunar cycle could be more energetic than the waxing half. Uranus in Aries stations direct on January 2. Uranus will move into a new sign this year too. In May, the Awakener visits Taurus. New pathways are opening. 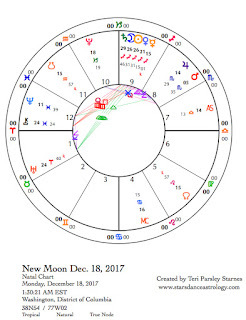 January 9, the Sun, Venus and Pluto conjoin to begin new cycles of transformation tempered by relationship. We get a powerful download about the next few years. Venus influence encourages reception over conquest. Venus and the Sun make a square aspect to Uranus on the last day of this lunar cycle. This is an agitating and impatient energy. The seeds of this lunar cycle have created seeds themselves. The next generation of seeds wait for the right time to burst open. We feel them tremble with possibilities now.